Hong Kong, 5 October 2018 – For the first time, Fine Art Asia 2018, Asia’s leading international art fair, was held alongside Ink Asia 2018, the world’s first fair dedicated to ink. Together, the two events showcased an outstanding array of antiques, fine art and ink art presented by world-renowned galleries, and attracted many knowledgeable dealers, collectors and connoisseurs. Fine Art Asia and Ink Asia 2018 were staged from 29 September to 2 October in the Hong Kong Convention and Exhibition Centre, with a Private Preview and Vernissage on 28 September, at the peak of the October art season in Hong Kong, coinciding with Sotheby’s and China Guardian’s auctions in the same venue. The Honourable Mrs Carrie Lam Cheng Yuet-ngor, GBS, JP, Chief Executive, Hong Kong SAR Government, was the Guest of Honour at the Official Opening and visited the booths of leading galleries. Mrs Lam has most kindly officiated at the opening of Fine Art Asia for the past 6 years. Fine Art Asia and Ink Asia 2018 presented a fabulous display of museum-quality antiques, fine art and ink art from both East and West. The 10,000-square-metre exhibition space provided a showcase for more than 10,000 stunning works of art, worth a total of over HK$4 billion (US$510,360,000). The fairs were attended by 25,000 visitors from all over the world. Artworks spanning 5,000 years of cultural history included Oriental and Western antiques; Impressionist, modern and contemporary art; fine jewellery, antique silver and timepieces; and photography. Since its inception in 2006, Fine Art Asia has constantly pioneered new categories to excite the new generation of keen and well-informed collectors in Asia. David Aaron, London has presented Near Eastern, classical and Central Asian antiquities for the past six years; while this year, the audience had the opportunity to view Greek, Roman and Egyptian antiquities at Art & Archaeology Horiuchi, London, exhibiting for the first time. In another “first”, exquisite antique and modern French tapestries were showcased by Boccara Gallery, Paris/Brussels, creatively curated with modern and contemporary artworks. Nicholas Grindley, UK reported a hive of activity on the opening day at his booth specialising in Chinese antique furniture and works of art. 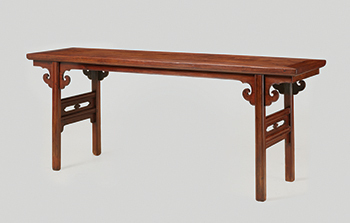 Many scholar’s objects were sold, followed by the sale of two major pieces during the fair: an important huanghuali inset leg table from the late Ming Dynasty; and a square huanghuali table from the same period that was on loan to the Museum of East Asian Art in Cologne. Rasti Chinese Art, Hong Kong was delighted with the success of his exhibition of antique Chinese jades, enjoying good sales of pieces from the Han Dynasty (206 BC – 220 AD) to the Qianlong period of the Qing Dynasty (1736-1795), including three major pieces including a large white jade vessel in the form of an open magnolia flower, and an Imperial yellow jade archaistic rectangular vase, both from the Qianlong reign. Maria Kiang Chinese Art, Hong Kong specialising in scholar’s objects, and Orientique, Hong Kong exhibiting Chinese antiques and works of art, had steady sales at the fair. 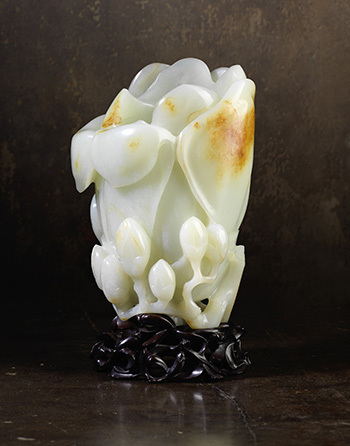 Following a successful debut in 2017, Jorge Welsh Works of Art, London/Lisbon, specialists in Chinese export ceramics, again reported good sales of 18th century porcelain from the Kangxi (1662-1722) and Qianlong (1736-1795) reigns. They also made many valuable new contacts with clients in Asia. Also in the category of Chinese porcelain, Santos, London had an excellent fair, selling several major pieces of blue and white porcelain from the Kangxi reign as well as some Song Dynasty (960-1279) pieces. Like last year, Fine Art Asia had a strong showing of Himalayan art, with renowned galleries such as Carlton Rochell, New York, Rossi & Rossi, London/Hong Kong, Tenzing Asian Art, San Francisco and Jacques How Asian Art, Brussels all present. 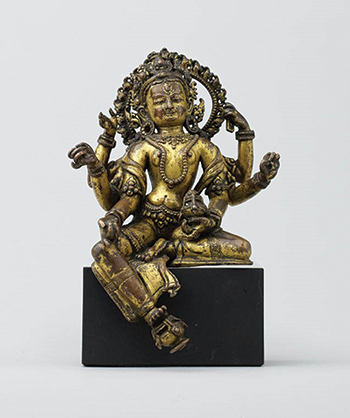 Among sales, Rossi & Rossi sold three pieces including a gilt copper Vasudhara dating from the 15th century in Nepal. In the Silver category, Koopman Rare Art, London, were pleased with multiple sales of fine English silver from the 16th to the 20th century. 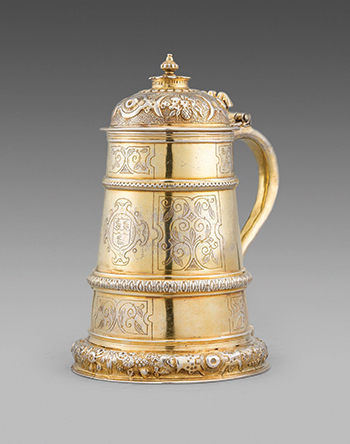 A highlight sale was of an exceptionally rare, silver-gilt tankard from the reign of Elizabeth 1, made in London and dating from 1578. The sides engraved with Tudor designs and the front with a coat-of-arms, this was particularly rare in being a secular, rather than an ecclesiastical piece of silver. Esmé Parish, Singapore also had a successful fair, with good sales of her speciality, Chinese export silver, on which she also presented a lecture as part of the Academic Programme at the fair. Meanwhile, Silver and Silver, Bologna, continued to attract clients with their rare vintage Bucellati silver. 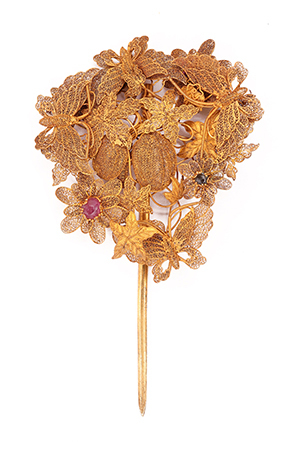 Amongst the jewellery specialists, Susan Ollemans, London had steady sales, including her catalogue piece, a fine silver gilt Chinese hairpin from the Qing Dynasty, 19th century. YEWN, Hong Kong had good sales of Dickson Yewn’s contemporary creations inspired by Chinese dynasties; while Kai-Yin Lo, Hong Kong presented her ‘History to Wear’ collection, incorporating Chinese and Central Asian antiques into stylish wearable jewellery. On Tung Jewellery, Hong Kong saw returning clients from last year, interested in their contemporary jade jewellery which features innovative ways of mounting and design. This year jeweller Ilgiz F., Moscow exhibiting at the fair for the first time enjoyed a warm reception for his creations of flowers and dragonflies in enamel, gold and gemstones that have a strong affinity to the work of Art Nouveau artists such as René Lalique. D’Joya, Birmingham made valuable new contacts and felt Fine Art Asia is an ideal platform for their jewellery. Once again, visitors to Fine Art Asia 2018 had the unique opportunity to view Impressionist and modern art exhibited by leading Western galleries such as Gladwell & Patterson, London whose highlights included a masterpiece by Claude Monet, Le Chemin de Halage à Granval; Director Glenn Fuller also gave a lecture “Impressionism and Collecting in the 21st Century” at the fair. Galerie Dumonteil, Paris/Shanghai/New York showed the best animalier art with highlight works by Rembrandt Bugatti and Diego Giacometti. Participating for the first time, Haynes Fine Art, London/Worcestershire brought exquisite Impressionist and Post-Impressionist works by Degas, Renoir and Henri Lebasque among others. Tanya Baxter Contemporary, London/Hong Kong, specialising in modern British art, had much interest in her works. 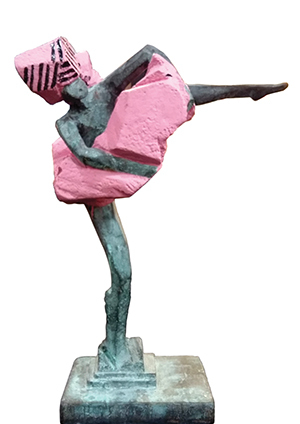 Key sales were of a delightful sculpture by famous Taiwanese sculptor Ju Ming from his “Living World” series entitled Skirt Story, and a rare original work by famous British graffiti artist Banksy (b. 1974) entitled Bomb Love, executed in 2003 in spray paint on cardboard. In the Oriental art category, Shibunkaku, Kyoto had constant interest in their works by renowned Japanese artists Inoue Yuichi (1916-1985) and Morita Shiryū (1912-1998). An important work by Morita, Mushin (Innocence) c.1966, was sold at the fair. Pine’s Art, Taipei, specialising in contemporary literati art and calligraphy, were very happy with their sales. This year they highlighted the works of the late Chang Ch’ung-Ho (1914-2015) who was famous in China in the 1940s. 11 of the 12 pieces of her traditional calligraphy sold on the opening day. They also sold 20 paintings by Tung Chiao (b. 1942). 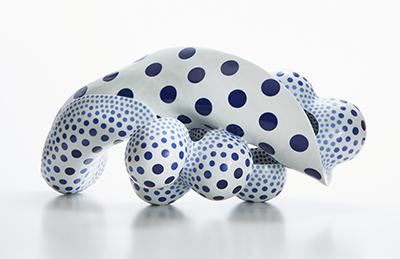 Sokyo Gallery, Kyoto, specialising in contemporary Japanese sculpture, sold a major piece illustrated in the fair catalogue, Multiplying Forms – 1805 by Harumi Nakashima (b. 1950); while wamono art, Tokyo/Hong Kong sold several pieces by contemporary Japanese artists. A strong Photography section at this year’s fair attracted much interest. Seven international galleries participated, as well as the University of Hong Kong Museum Art Gallery with a special exhibition “At the Turn of the Century: Pictures of the Past” featuring photographs of Hong Kong taken by Hungarian Dezsó Bozóky in 1907-1908. Good sales were reported by Boogie Woogie Photography, Hong Kong which curated the section, including works by French photographer Raymond Cauchetier (b. 1920) and Japanese photographer Takeshi Shikama (b. 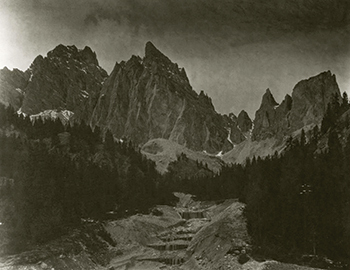 1948) including Contemplation – Dolomiti Rudovoi, sold to renowned Asian antiques dealer Daniel Eskenazi. Pékin Fine Arts, Beijing/Hong Kong also had a successful fair, selling a number of works. Leading galleries at Ink Asia 2018 demonstrated how ink has successfully made the transition from tradition to contemporary. 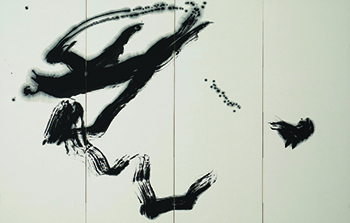 A wide range of media including paintings, calligraphy, prints, sculpture, video and installations showed the spirit of ink is by no means limited to traditional paintings on rice paper. INK studio, Beijing also had good sales, including three paintings by Li Jin (b. 1958) and one by talented young artist, scholar, writer and film-maker Bingyi (b. 1975). 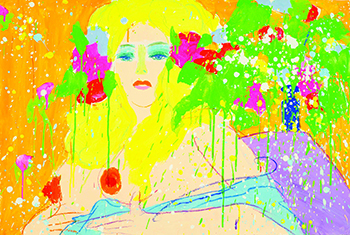 Chelesa Art Co. Ltd., Hong Kong/Shanghai meanwhile sold 6 paintings by Shi Hu (b. 1942) including their catalogue piece, Two Nudes, while Alisan Fine Arts, Hong Kong sold an important painting by Walasse Ting (1929-2010). Many visitors enjoyed the special ‘Tribute to Lui Shou-kwan’ exhibition organised by The Ink Society, Hong Kong, which also organised an Academic Programme of lectures and seminars by leading experts at the fair.